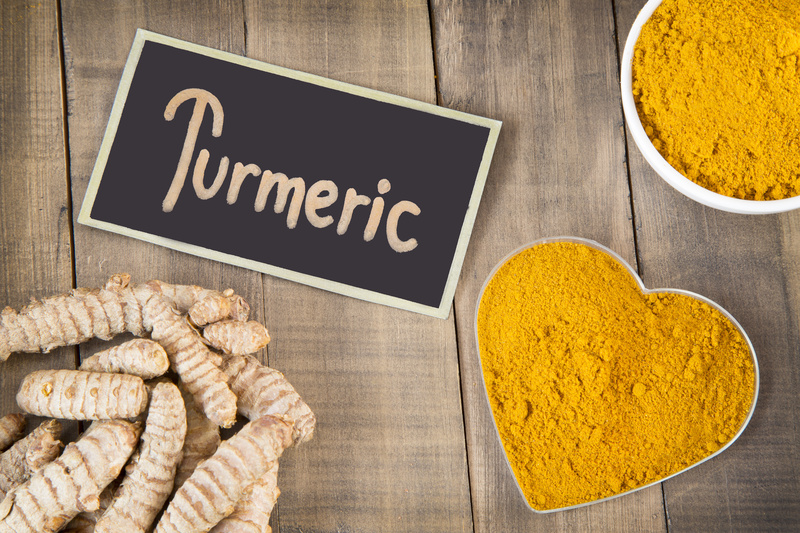 Tumeric is a well known Asian spice that is commonly found in most curries, but is getting gaining interest for it’s many health benefits. There have been numerous studies showing that this beautifully coloured spice can cure many things from heartburn, upset stomach to more chronic illnesses like diabetes, depression, Alzheimer’s and even cancer. It’s inflammatory in nature so can assist with many inflammatory issues. CLICK HERE to see an article from the BBC’s Trust The Doctor series for more information on this. While turmeric is considered safe it’s always worth consulting a health practitioner, especially if you are on any type of medication or are pregnant or trying to get pregnant. Now of course we always have to take any research with a pinch of salt as studies can be manipulated and misinterpreted and lets also keep in mind that we are all very different and what works for one person may not work with another. So thinking on that, it’s always my philosophy to encourage you to become the master of your own body and figure out what works for YOU! However when some health benefits show to be common in a lot of people I feel it’s always worth giving it a shot. Now at this time of year when the bugs and illnesses are doing the rounds and your work colleagues are dropping like flies it’s probably a good idea to give your immune system a boost in any way you can. Learn to listen to your body and if you are feeling more tired or have the onset of a cold coming on, do what you can to allow the body to rest. Choose good nutrition eating a range of healthy and nutritious fruits and vegetable on a daily basis. Ensure adequate hydration and address your lifestyle. All of which contribute to a happy healthy body. We can however look at simple ways to add more Tumeric into your diet. For some time now this immune boosting tea has been my own go to, not just when I feel something coming on, but I now have it most mornings. And it definatly is my top choice over chemical laden Lemsip concoctions. It is very simple to make using Tumeric powder, ground Ginger, Lemon Juice and a dash of Honey to sweeten. Then finally a dash of black pepper as this has shown to increase absorption of the chemical compound Curcumin. You only need a small amount (approx. ½ a teaspoon of each but feel free to adjust the quantities to your own taste. 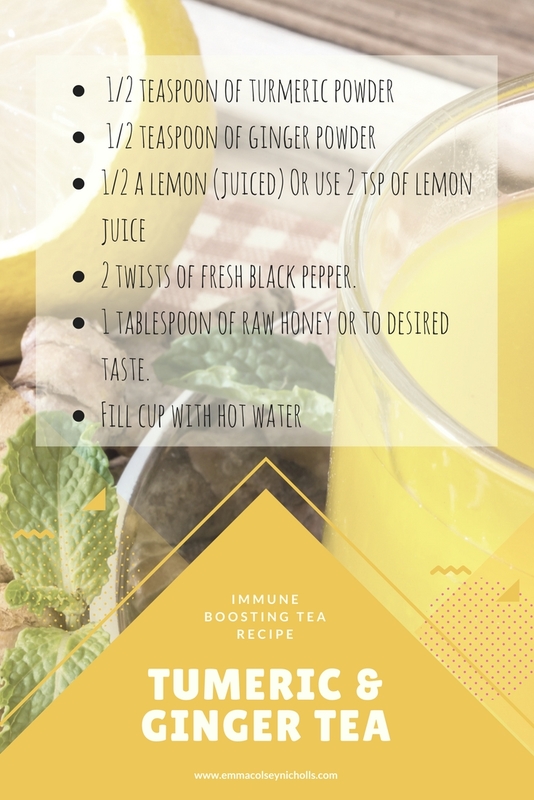 The added ginger and lemon add to anti-inflammatory and alkalising qualities and the honey not only adds to the taste but can also be beneficial for a tickly throat. Or if you decide that the tea is not for you, it can take a little getting used to although I really like it I get that some may not CLICK HERE to check out Lean Greens Organic Tumeric Supplement and use the code EMMA10 to get 10% discount. Do you use turmeric? Have you noticed any other benefits? Comment below with your experience of using this spice. Want more tools and tips for a happy healthy body. Enter your email below to get my FREE 7 day Mind/Body Re-set Program.